It turns out that cauliflower may as well be the mascot of produce versatility. You can use every single bit of it — the florets, stem, and leaves — and because each component is quite different, you can apply vastly different techniques to achieve a variety of flavors and textures. But here's the best part: because each component, no matter how disparate in preparation, came from the same vegetable, they will all taste cohesive together. That's not all; because cauliflower is such a large vegetable, it yields several portions, which means you get even more mileage if you're preparing solo meals. In other words, make cauliflower your best friend. For this dish, you only need about one-fourth of a head of cauliflower to yield what you see in the photos here, but I like to make extra of each component so I can easily throw a second dish together for another meal. I would recommend using one half of the cauliflower for this dish and having leftovers and using the other half for another dish. Start by separating each component: the florets, stems, and leaves. You will be roasting half of the florets and pureeing the other half. The stems and leaves you'll be pickling in the same pickling liquid. Piece of cake! 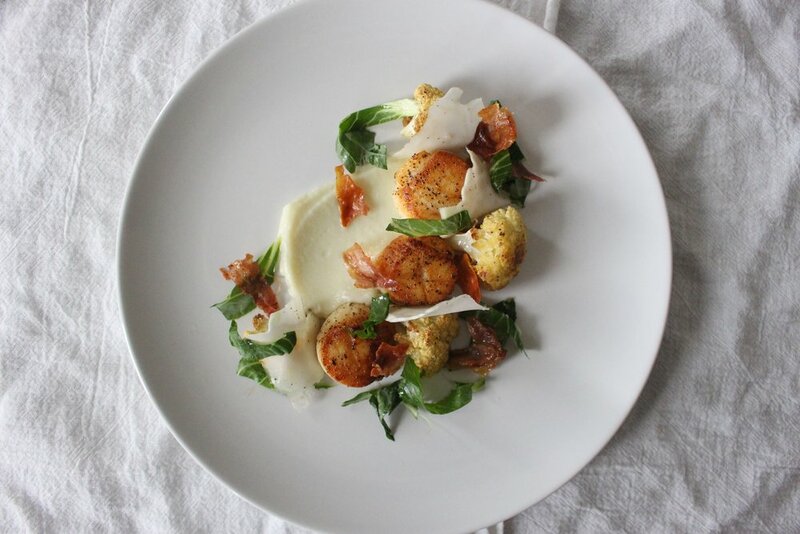 While cauliflower might sound like the star of the dish here, it's impossible to ignore beautifully seared scallops. which I feel is a perfect accompanying protein. Both scallops and cauliflower have an inherent sweetness, but when seasoned can absorb other flavors and become complex and nuanced. Then, to give the whole dish extra textural interest and some pops of umami, I sprinkled crispy prosciutto chips on top. I had a few slices of prosciutto left over that weren't enough for much of anything so, again, I tried to get the most mileage out of them by turning them into a super tasty, "fancy" garnish. Recipe below. Pat scallops dry with a paper towel and season with salt and pepper. Set aside. Place 1/2 cup cauliflower florets in a shallow baking dish, drizzle with olive oil, and season with salt and pepper. Bake for 20 minutes, or until fork tender. Thinly slice the cauliflower stem lengthwise on a mandolin slicer. Chop the leaves in a rough chiffonade. In a mixing bowl, whisk together the rice vinegar, sesame oil, and season with salt and pepper. Add the stems and leaves and toss to combine. Set aside. Add the other 1/2 cup of florets to a sautée pan with the milk and garlic, season with salt and pepper, and bring to a boil. Reduce heat and simmer until the florets are fork tender, about 8-10 minutes. Add florets to a food processor with about a tablespoon of the milk to start with; purée until smooth and silky. You can add more liquid until you get your desired consistency. You can also adjust the seasoning as you process. Add olive oil to a non-stick skillet on medium-high heat. When the oil is hot enough, add the scallops (they should sizzle when they hit the pan). Don't turn the scallops until they've developed a golden brown crust on the bottom side, about 1 1/2-2 minutes. Then turn and quickly sear the other side for about 15 seconds. The center should remain slightly translucent. Remove from heat and set aside. Add the prosciutto back to the same skillet and fry on medium heat until they are brown and crispy, about 2-3 minutes. To assemble, smear a generous spoonful of the cauliflower purée on a plate, top with the scallops and roasted cauliflower. Insert slices of the pickled cauliflower stems in between the scallops and roasted florets. Sprinkle with the leaves. Break apart the prosciutto chips and sprinkle around the plate.